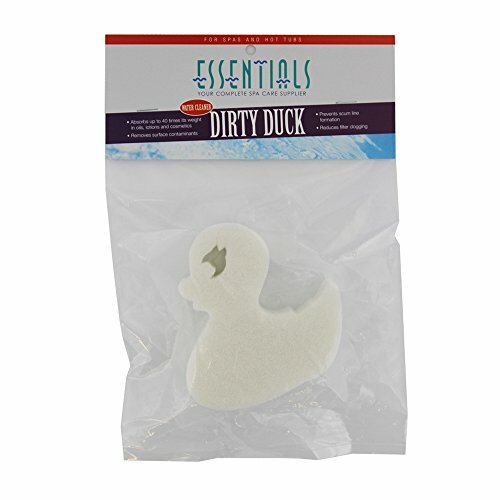 The Dirty Duck absorbs surface contaminants to prevent scumline formation, reduce filter clogs and maintain clear water. It absorbs 40 times its weight in oils, lotions and cosmetics. Drop Dirty Duck in hot tub water. Let float in the water to absorb. When one side is dirty flip over. When both sides are dirty rinse and reuse. Replace as needed. Hot Tub Things is your premier source for spa parts and hot tub parts online. With over 30 years of experience in the hot tub industry, we are committed to high quality, low prices, and phenomenal customer service. We’d like your experience at Hot Tub Things to be a positive reflection of our commitment to these values. Whether you are looking for a custom spa cover, a hot tub ozonator, a spa cover lift, spa chemicals, a spa heater, a hot tub filter, a spa circuit board, or spa accessories, you have come to the right place!